This time of year makes me want to be outside, enjoying the fresh air and sunshine! Over the last few weeks, I was reminded of all the fantastic paths and walkways scattered through the Vernon area. It is a great time to be out walking and hiking, whether you are enjoying the beautiful Kalamalka Lake, stopping at BX Falls on your way up to Silver Star, or spending time downtown and enjoying the fauna and fowl in Polson Park. A great resource for finding your way around the trails and paths in the Vernon area is the Ribbons of Green Trails Society. They list out and describe all the main walking areas in and around Vernon. This group started off as a committee to develop a plan for a system of linear parks, paths and bikeways in the Vernon area. The “Ribbons of Green” plan was adopted into the official Community Plan of the City of Vernon. The committee is now a legal society, and offers great resources for enjoying the Vernon area on foot. 1. Polson Park Walkway. This is a surprisingly lovely little walk. Starting in Polson Park itself, just by the Japanese Gardens. The path is just less than a kilometer and will take you out on Polson Dr. You can also ride bikes along the boardwalks, and it makes a good detour on the way to Kalamalka Lake Park. 2. If you are looking for a more difficult route, try BX Falls. This is a great place to go on a hot summer day to escape the heat in the shade of the cedars along BX Creek. You can enter the trail from the top off of Tilicum Road, or from the lower end, off of Star Rd. 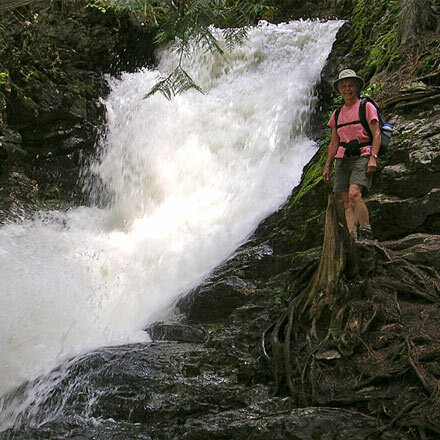 The whole hike is about 3.7kms, and if you want a more leisurely stroll, I suggest the south end but if you are up for climbing MANY sets of stairs, the upper end to the falls themselves is a great way to get your heart rate going. And these should get you started. But if you would like some more personal recommendations or to chat about all the things Vernon has to offer, please don’t hesitate to reach out!